Citation Information: J Clin Invest. 2018;128(11):4770-4786. https://doi.org/10.1172/JCI120923. Targeted delivery of NPs to DLNs. (A) Schematic of IR800-NP synthesis and conjugation with MECA79 mAb. (B) Hydrodynamic size distribution and ζ-potential of the IR800-NPs and MECA79-IR800-NPs (mean ± SEM, Student’s t test, **P < 0.01, ***P < 0.001). (C) Representative transmission electron microscopy image of IR800-NPs. (D) Skin allograft recipients were injected i.v. with either IR800-NPs or MECA79-IR800-NPs at day 7 after transplantation. Live fluorescence imaging at 24 hours after administration (i.v.) showed greater fluorescence signal in the DLNs (Axi LN and Bra LN) of mice injected with MECA79-IR800-NPs. 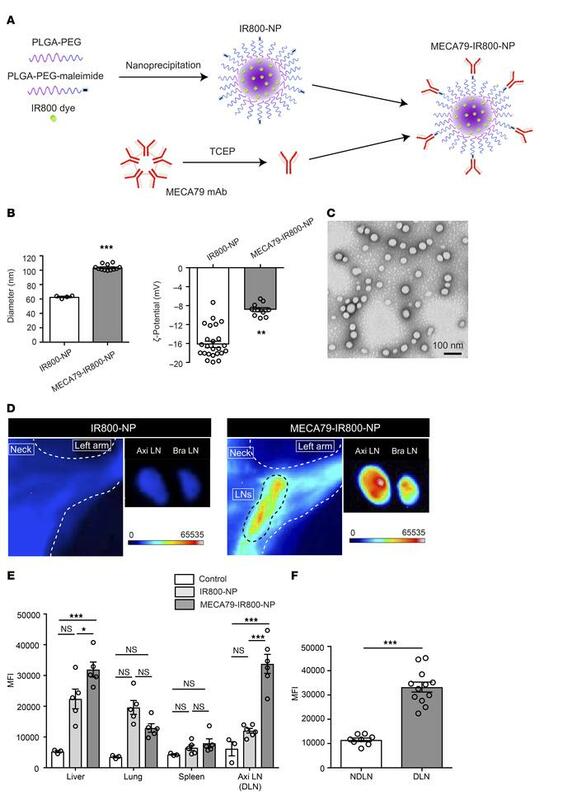 (E) Biodistribution of MECA79-conjugated and nonconjugated NPs, in addition to uninjected control, assessed via fluorescence imaging at 24 hours after injection (i.v.) of NPs (DLN: control vs. IR800-NP vs. MECA79-IR800-NP: 6,179 ± 2,307 vs. 12,033 ± 766.1 vs. 33,779 ± 3,096, mean ± SEM, ANOVA test, *P < 0.05, ***P < 0.001, n = 3 mice per group, 1–2 LNs from each mouse). (F) Trafficking of MECA79-conjugated NPs into DLNs and NDLNs (NDLN vs. DLN: 11,536 ± 732.1 vs. 33,264 ± 2,046, mean ± SEM, Student’s t test, ***P < 0.001, n = 4–6 mice per group, 2 LNs from each mouse).